Gullah/Geechee Chillun Cookin fa e Culcha! The Gullah/Geechee Nation is globally known for its foodways traditions. Many people will quickly say that the only thing that they know about the term “Geechee” is the fact that “Those folks eat a lot of rice!” As true as that statement is, we ain be wan no dry rice! Hunnuh hafa hab oda ting fa nyam pun wid disya ya! To that end, there are many outstanding traditional cooks throughout the Gullah/Geechee Nation. The best food that you will ever eat will be at the home of an elder or at a fish fry or crab crack held on the Sea Islands under an oak tree. Given that fact that so many come to the Gullah/Geechee Nation for the food, many restaurants and catering companies have menus listing “Lowcountry faire” and “soul food” and such. However, many are using standardized recipes and techniques that they have learned at technical colleges that teach culinary courses and some of the kitchens do not have Gullah/Geechee cooks. Well, those that live Gullah/Geechee traditions have now sought to combine these two elements and pass on professional commercial kitchen techniques with Gullah/Geechee culinary aspects to the next generation. 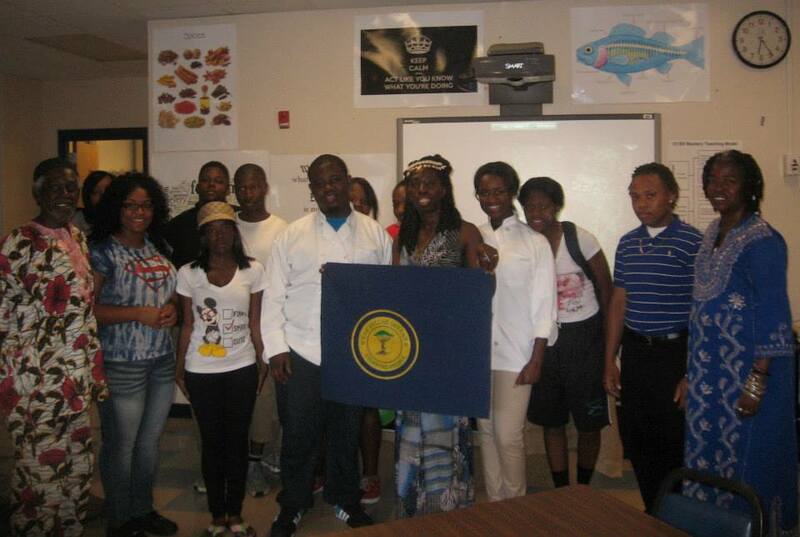 In Beaufort County, SC, the Lowcountry Boys & Girls Club, South Carolina Coastal Community Development Corporation, and Marshview Community Organic Farm held a “Stir It Up Cookoff” for their 4th teen Gullah cooking class graduates on May 31, 2013. The event was held on historic St. Helena Island at the South Carolina Coastal Community Development Corporation as a fundraiser for the next class. Up the road a piece in Charleston, SC at historic Burke High School, the Burke High School Culinary Arts students led by Chefs Ira Hill and Benjamin Dennis held a fundraiser for their department of the high school and for the Gullah/Geechee Angel Network (www.gullahgeecheeangelnetwork.com) which is the official 501(c)3 non-profit for the Gullah/Geechee Nation. Queen Quet, Chieftess of the Gullah/Geechee Nation, Elder Carlie Towne, Executive Director of the Gullah/Geechee Angel Network, and Gullah/Geechee Nation Representative Brother Hadis stand with the Burke High School Culinary Arts students at the Gullah/Geechee Angel Network fundraiser hosted by these future Gullah/Geechee chefs. The “Gullah/Geechee Pop-up Dinner” was a true fellowship affair. While the students served each surprise delight of the evening in family style plates, the audience got to view a series of documentaries that focused on the Gullah/Geechee Nation. This set the tone for the community to truly understand the value of what they were contributing to by taking the time to come over and sit down with the students for a traditional Gullah/Geechee meal instead of going to one of the “upscale” restaurants in the city. The meal was truly worth more than what they would have paid for way less at one of those other restaurants too! We gladdee fa kno sey folk da lun de chillun bout how fa cook, but de tru blessin da de Gullah/Geechee chillun cookin fa e culcha! We look forward to hearing of many outstanding Gullah/Geechee chefs in the future. We pray that they will always stir Gullah/Geechee Nation culture and history into every pot and serve up Gullah/Geechee love over the bed of rice and all else that lays on every plate that they create. Gwine on chillun!